Yes, it's almost here...Christmas is around the corner. It's the time of joviality, a mood characterized by high spirits and amusement, immense baking, packing gifts and most of all the fun I have is wandering around in the Mall with my family and going on a shopping spree. Snow covered street and trees, illumination work in the front yard of houses are a spectacular view during the Christmas season. It was few years ago we flew back home during Christmas season for a vacation and the aerial view of snow covered houses decorated with lights still remains as a magnificent view in my memory. Weather channel is forecasting a snow storm that is catching up strength and is supposed to make its way to North East on Christmas. So it could be a white Christmas to celebrate!!!! For the last one month, I had been in the process of soaking fruits to bake the 'Kerala Fruit Cake/Kerala Plum Cake' and was impatiently waiting to bake it and see the outcome. 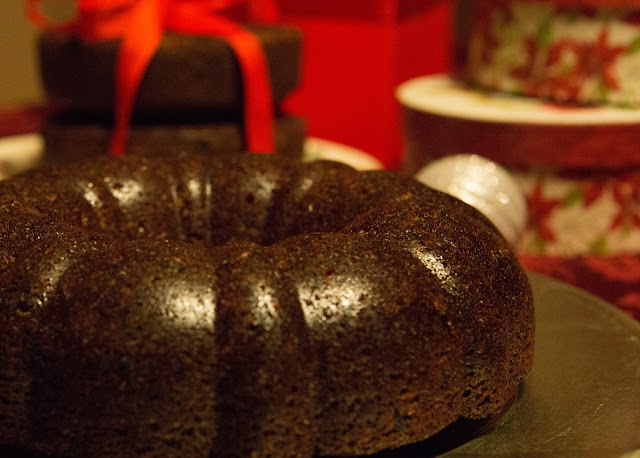 It is the traditional fruit cake everyone bakes during Christmas time in Southern part of India. My effort to make the Fruit cake did not yield a satisfactory result. 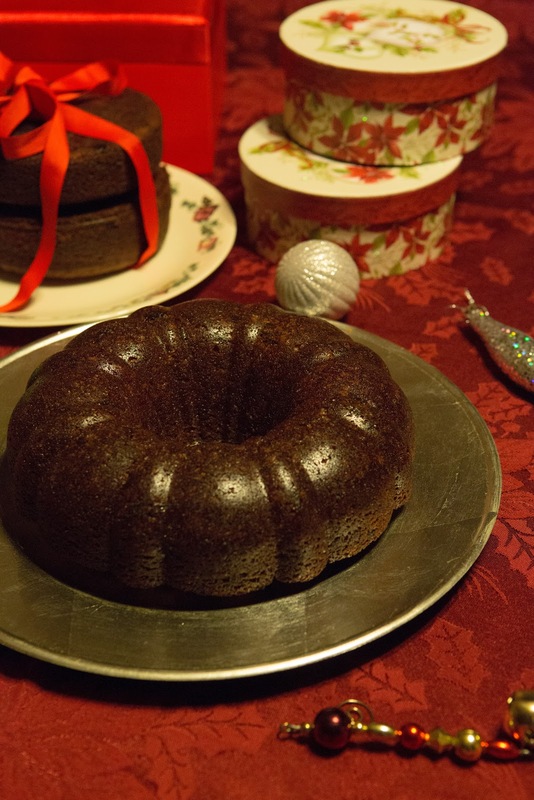 So I was frantically searching for a perfect cake recipe that could fit the holiday season. 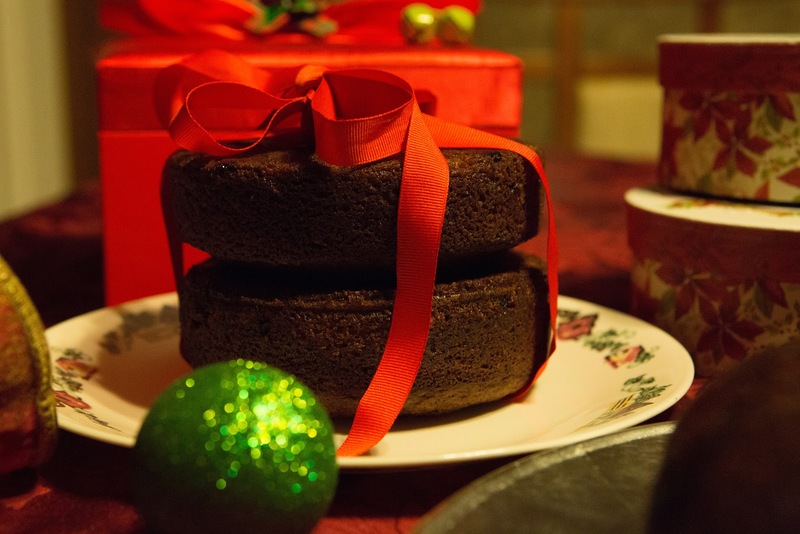 My desperate quest to find a perfect recipe for Christmas cake ended when we went for Christmas Caroling last week. I had this wonderful cake from one of the members of our church. I was so determined to get the recipe and asked the host of the house to email me the recipe. She was very nice to share the recipe with me. This is one of the cakes you would never feel bored of. I could gobble pieces in minutes. The dark richer color combined with the super moist texture and the aroma from spices makes it an acceptable substitute for the Kerala Plum cake, in case if you are too late to soak the fruits for the Plum cake. Give this recipe a try and I can assure you that you will not regret a bit and would put the Plum cake in the back burner. I divided the batter between a bundt cake pan and a 6'' round pan. My daughter wanted to give the small cake to her teacher. So I wrapped it up like a candy using parchment paper and tied the ends with sateen ribbon and hanged a homemade tag on it. It truly looked like a perfect Christmas gift. Since I had to send it out with my daughter in the morning to school, I didn't get time to take the picture of the edible gift I wrapped up. Take a heavy bottom pan and melt 1/2 cup of sugar over medium heat. When the sugar starts to melt and become dark brown, lower the flame and carefully add 3/4 cup of water and boil till the sugar crystals melts completely and forms slightly thick syrup. Keep it aside to cool. Sift the flour, cinnamon, cloves, nutmeg, baking soda, baking powder and salt 3 times to aerate the dry ingredients. In a medium bowl beat the eggs, vanilla and sugar with an electric mixture till fluffy. Add the caramelized sugar syrup and oil and beat for another minute. Slowly add the flour mix into the egg mixture and beat for 1 minute till everything is well incorporated. Fold in the chopped dates and grated carrots into the cake batter. The batter should be slightly loose. If needed add 2 - 4 tbsp of milk to loosen up the batter. 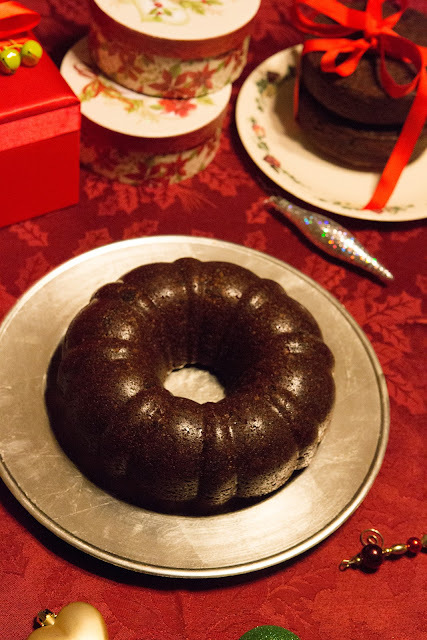 Pour into 2 greased 8'' pan lined with parchment paper or a large non-stick bundt cake pan and bake for 50 minutes or until a toothpick comes out clean when tested at the center of the cake. Make sure that you use greased parchment paper to line the pan for any easy release, as the cake is slightly sticky due to the added dates. Cover with cling ware and wrap with aluminum foil and store in air tight container. I really like the carrots in this - such a nice cake! And wonderful for Christmas. Speaking of which, I hope you have a wonderful holiday! First time here. Happy to follow you. Do visit mine too. This is soo rich n delicious with lovely Flavours! This cake is divine..I got to taste it :)...Ultra moist and soft...I highly recommend this! I have bookmarked this recipe. I will try this out soon! Thanks a ton Shema for endorsing the cake!! !